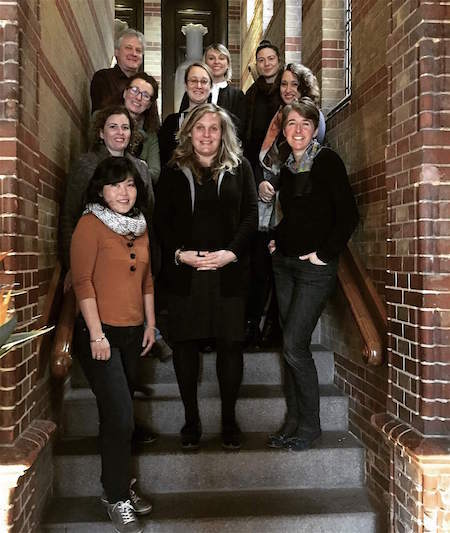 Gillian Colhoun and Stuart Delves ran a two-day, bespoke course for Irdeto’s marketing team in Amsterdam this January. Here’s their conversation about that experience, and a follow up email from a participant that all of us live for. Gillian, it was great co-tutoring with you again. The first time at Highgreen Manor in Northumberland and this last time in perishing January at the College Hotel in Amsterdam. The link between the two courses, the first open and the second closed, bespoke or ‘in-house’ was, of course, Irdeto’s Solution Marketing Manager Jo Wall. Who’d have thought that six months after Highgreen she would be in touch with us asking us to tailor a foundation course for her multi-national team based in Amsterdam. It would be interesting to muse on what were the key differences between the open and the bespoke. Dark Angels have done several bespoke courses before but we’ve never really highlighted the differences. What springs to mind first for you? My first thought was the group dynamic. One of the more beautiful aspects of the open courses is that people arrive as strangers and leave as something quite different. In just a few short days, they go from knowing absolutely nothing about the person sitting on their right, to sharing a bond that holds them together long after the smells and sounds of the course have dimmed. Whether it’s through tackling often poignant exercises together, or acknowledging emotions that take one by surprise, the friendships live on. Would this rather thrilling element to Dark Angels be lost in a group who already know one another? Might they be less inclined to jump in to the exercises for fear of a judgmental glance from a co-worker? Of course, I really shouldn’t have worried since all eight members of this talented team arrived with a joyful desire to be a better writer and nurture mutual understanding. Every one eager to explore underlying principles – not to dictate or invent “rules” on writing – but to introduce ways of thinking that would make them better listeners and communicators. And from their feedback and work, they absolutely succeeded. Having done similar types of bespoke courses before, has this been your experience in the past? Where does the magic come from I wonder? Yes, an appetite for learning and improvement has always been there in the teams we’ve worked with before and I think that’s pretty crucial to our methodology. The Irdeto team was carefully picked and had good rapport, which enabled them to embrace the newcomers. There’s always, I feel, a greater weight of expectation on a bespoke course that the sessions will ‘deliver’, in other words help to answer key issues like tone of voice or writing within business constraints. I’m glad to say that once again we manifestly helped on this score. But I think the magic comes from the personal dimension. It always amazes me that our short course can go so deep in such a brief space of time. And I think this is because even on a bespoke course, where we apply the learning to real brand and team situations, we still run our personal writing strand in parallel. I know we get responses like ‘life-changing’ on our open courses but to get them on a closed course as well still delights me after twelve years. I know you achieved some pretty deep mining in your 1-2-1 sessions. Without betraying any confidences can you say a bit about this? I felt very privileged to hear how individuals felt about their personal writing; how they could channel this rediscovered energy into their world of work. 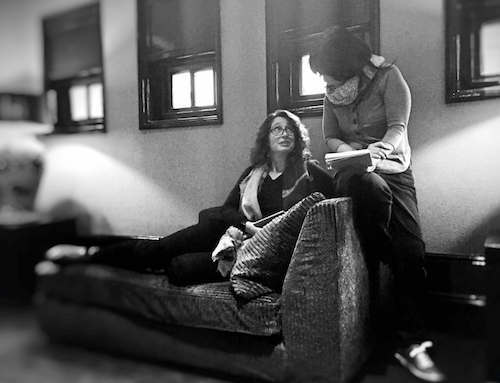 We discussed many different things; the momentum to be found in writing memoir, or the sweet liberation in tackling the most opaque technology regulation in a series of 250 word stories. We appreciated the role of graphic design and how its rules can give shape and meaning to our carefully considered paragraphs. For those writing in English as a second language, we talked about sharpening our ear to more elegant phrasing by reading more, yes, but also by listening more. BBC Radio 4 has some of the best rabbit holes to venture down where that’s concerned. And ultimately we chatted about giving ourselves permission to play with words and see where the joy of that process can take us. The last morning was significant for me. 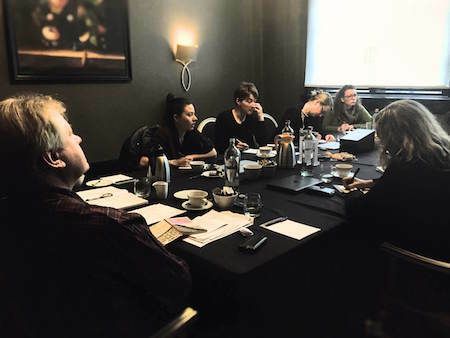 It was fun to take a lot of what was discussed during the personal writing exercises and start to apply those learnings to the Irdeto branded content. In just two days it felt like the group achieved a significant amount as a group and as individuals. Do you agree? Luckily the air in Amsterdam was icy those two days, as it helped to mask our blushes as we left the hotel for the tram stop. It strikes me that this format lends itself rather superbly to the needs of a corporate communications team. That gentle balance of exploring the individual as well as the organisation means we were able to nurture the flowers and get to the worms – lovely. I cannot imagine that anyone reading this blog is a supporter of Donald Trump. The new president glories in the absence of books in his life, revels in his lack of reading. That might be the scariest fact about him, and it’s not an alternative fact. 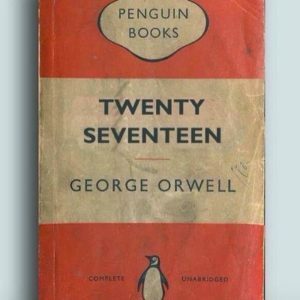 The adapted version of the classic Penguin 1984 cover speaks to me about the times we are currently enduring. I’ve blogged here before that art and creativity have to be the best counters to dark forces like Trump. I’m just reading Colson Whitehead’s brilliant novel The Underground Railroad set in slavery-era America. It’s impossible to read that novel then support Trump. Fiction really is the most powerful antidote to Trumpism because it nurtures our empathy for other human beings. Last week I was proofreading my novel Spanish Crossings that will be published in April. The story involves the 1930s rise of fascism, the Spanish civil war and the child refugees from that war. When I began writing it I had not anticipated that it would have such an uncanny relevance to our current times. If I had anticipated that, I might have recoiled in horror and become more polemical. I’m glad I didn’t because the novel – any novel – has first to be a human story not a political treatise. Proofreading has given me this strange experience. I finished writing the novel nearly a year ago and since then I’ve been concentrating on other work (including another novel). So I came to the proofreading task with fresh eyes and open mind, and I read the book as if it had been written by someone else. It’s a very weird feeling. When I came to the ending I had tears in my eyes. Am I allowed to cry at my own book? I remembered Jamie Jauncey’s favourite quotation from Robert Frost: “No tears in the writer, no tears in the reader.” Here I had been both writer and reader. If you want to pre-order the book you can do so here >> I’m pleased to say early readers of proof versions have been very enthusiastic. So 2017, for me, promises to be a creative year, my own antidote to Donald Trump and all his works. It is appropriate in a way that I will be running the first American Dark Angels course in New Bedford, Massachusetts in October. I’ll be doing that with my good American friend Richard Pelletier and you can read about it here >> The location has literary links to Herman Melville and Louisa May Alcott, fiction writers who linger in the minds of millions who have read them over the past centuries. Out of the blue, and so appropriately, I was sent the image shown below by Anita Klein, who collaborated with me a few years ago on The angel of the stories. She calls this new linocut ‘Angel protecting an acorn’. It seemed to me the perfect image for our Dark Angels venture.